Okay, so here's one of those books that I've felt bad forever for not reading. One of those books you hear about all the time, but just have never seem to get around to. You know the kind? 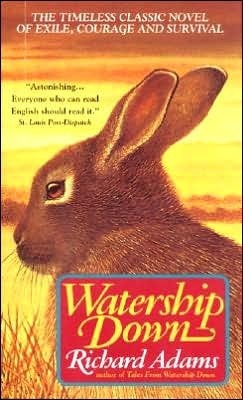 So I was quite pleased when my book club decided to add Watership Down to the line up this year. But when I saw how fat the book was, I was worried. That's a lot of words about rabbits! In the end, I read about 130 pages of this popular book and decided I had too many other things to read to suffer through 400 more pages. Yes, people, take note... I DID NOT LIKE IT! I highly doubt that's going to happen with this book. And why did I not like it? 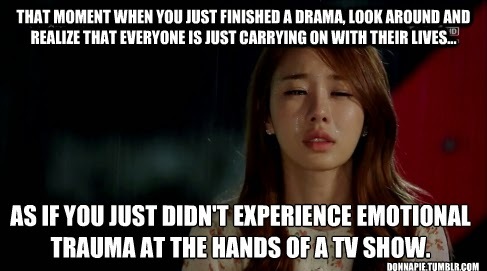 Seriously, it was just plain boring. I know. How can I even utter the word? But it's true, and so I moved on to a different book, and one that will probably end up in my top ten of the year. See, why waste time, right? Move on, right? BUT, you may ask, what did the book club think? how can you write 500 pages about rabbits? books (and movies etc.) that take animals and give them human characters are one thing, but those that allow them to "talk" yet keep their animal behaviors are another. the author said in his note "this is a book about rabbits.. there is no other point I'm making" and to that most of us say, "yeah, right. NOT." is this a kid book or an adult one? why do so many people like this? Sentimental reasons? Why do boys like this so much? Adventure? Really? In the end, it came down to this... do you or do you not like rabbits? We had book club members that came down on both sides! Up next month, Precious Bane by Mary Webb. Have you read it? This was a funny post. I say that because I had a somewhat similar experience. I won a gift card from a blogger and bought this book with it. I can't remember the big WHY I chose it, but I do know there was some discussion about it at the time. Anyway, I do not like talking animals in the least, but was somehow convinced that this would change my perspective. I bought it, brought it home, opened it up and read a chapter or so. Soon after, instead of being just a DNF, I returned it and bought something else. I'm very perplexed by its popularity, but to each its own! Joy: So glad you actually went and switched books! I don't know that I would have been "brave" enough to do that. Well, if you don't like books about talking animals, I can see why this one doesn't appeal. But it's one of my favorites. And not just as a kid- I reread it every few years and still love it. The descriptions, the characters, the adventures, the mythology, it's all very engaging to me. Jeane: I've heard a lot of people say they re-read it lots! Maybe it grows on you a bit too. This is a book I have tried and tried to read over my many years. Have never gotten into it. I am not a big animal stories book either. There have been a few over the years I really like (Rabbit Hill, The Underneath) but never this one! On a side note one of the teachers in my school is named Buckthorn after one of the characters. His mom loved this book! Jana: Someone named Buckthorn? Awesome! I hope he has a personality to handle it! I'm so surprised by the comments I've received regarding this book. And, look at the comments you're already receiving, I'm still surprised. This book evokes a lot of emotion in people! People really like it, don't they? I think I'm going to have to give it a try since I didn't have a chance to read it. But, I really could go either way and I don't know if I'm really do deal with the backlash if I don't like it, lol. Jenni: Gosh, I know! Crazy the feelings people have on this one. I love it. Yeah,I'm with Jenni, I didn't get a ton of comments on my post but people do love this book and tend to get snappy if you don't. I just don't get it. It was ok. Just ok, people. There's millions of better books out there. This is a book that I've been wanting to read, but after reading your review it is one that I will not be making a priority! I may get to it eventually!! Tif: You should try it because perhaps you'll be one of those that LOVE it! I have it on my shelf but haven't read it yet. Interesting post. Ann: Yes, It's been on myself forever too. I read this one (all the way through) in my pre-blogging days. I just didn't get it either. I mean, I liked the adventure and such, but I still can't believe how long it is and it's about rabbits. Melissa: I probably would have just read it if it wasn't so long. As it is, I just can't! I don't mind talking animals. I read and enjoyed Animal Farm. However, I did NOT enjoy Watership Down. And, my experience with this book was horrible. In the 6th grade, the father of one of my classmates volunteered to read to a few of the 6th grade classes once a week. That part is actually pretty cool. Not too many 6th graders get to have adults read to them. That kind of stuff ends around 3rd grade. The first book he read to us was Flowers for Algernon. I loved it! The next book he read to us was Watership Down. I hated it. But, once a week, I had to suffer for an hour while this guy read this book about talking rabbits. The horror, the horror! Jackie: What a fun (?) memory! Do you remember... did other kids seem to like it? Or was the horror felt all around? I think I'm really the only one at book club that liked this one. Yes, it was a bit of a slog. I had to force myself to keep reading, but I'm glad I did. I liked the mythology and the adventures. And the talking bunnies didn't bum me out. Jessica: Didn't Julie sort of like it too? I can't remember now. But yes, I keep hearing you in my head saying, "But they are NICE bunnies!"